Rakusan did not include the Fan Series in his main sequence numbering. Therefore, the original number used for each of the 36 Series prints has been modified to identify the Fan Series members of its theme. The five different fan silhouette shapes have been here assigned arbitrary numbers 1 through 5. To indicate a fan design these shape designations are added to the 36 Series number separated by a hyphen. 108-2 is the Fan Series design with fan shape 2 in the 108 Goldfish and Medaka theme. Like all other designs in this series, 108-2 was only produced in a single print run, and few copies are currently documented. The individual designs in the 108 Goldfish and Medaka theme were completed in at least two stages. Three of the five fan designs (including 108-2) have seal C which indicates a carving date during the first half of 1934. However, the other two fan designs and the 36 Series design 108 all have seal B which indicates a later carving period closer to the time of publication. The composition of 108-2 resembles a fishbowl viewed from the side. 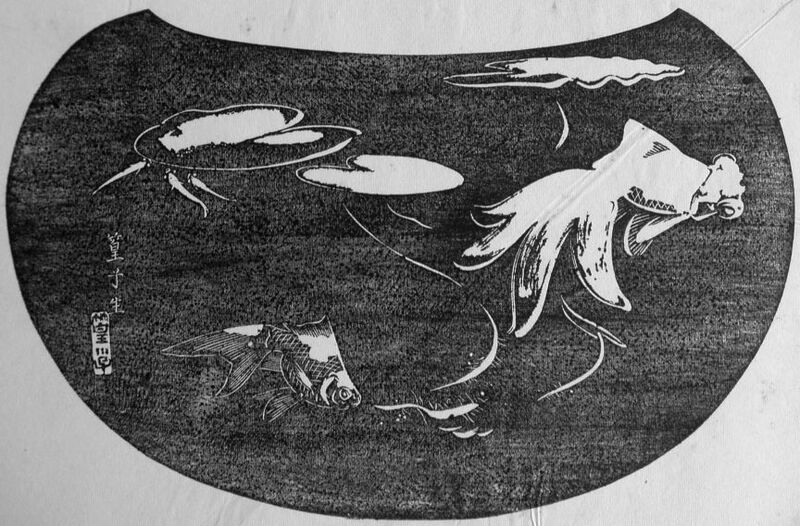 The surface of the water is indicated by three floating waterlily leaves and three medaka. Also in the water are the roots of the waterlily and two goldfish of different shapes and sizes. 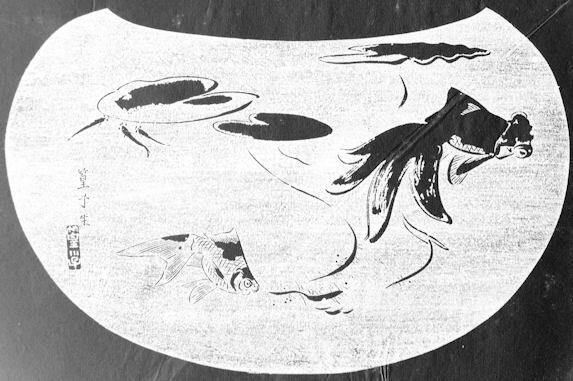 The medaka as usual are highly abstractly stylized, and the waterlily is also suggested with only a few lines and solid shapes. The two goldfish are drawn in more detail and the lower fish is finely engraved. Unlike some of the other designs in this theme, 108-2 is a normal carving where the ishizuri version is the exact reverse of the original sketch. Medaka (Japanese Killifish or Ricefish), Oryzias latipes, 目高, めだか, メダカ, medaka, although not a Japanese native, is common in Japanese waters and derives one of its English names from Japanese. This rather small (2-4 cm long) native of Southeast Asia is amphidromous, meaning it moves between salt and freshwater at some point in its life. It is commonly found in flooded rice fields in coastal Asia. The medaka has been a popular pet in Japan since the 17th century, and it is hardy and easy to raise. It varies from brown or yellow-gold in the wild to white, creamy-yellow, or orange in aquarium-bred individuals. Medaka are often conventionally represented in Japanese art as seen from above and as little more than a line for the body and two dots for eyes. The general name for any waterlily (genus Nymphaea) is 睡蓮, すいれん, スイレン, suiren. It is also used as the species name for Pygmy Waterlily, Nymphaea tetragona. Another name for Pygmy Waterlily is , 未草, ひつじぐさ, ヒツジグサ, hitsuji-kusa. The small scale of the plant in 108-2 suggests this species.